Harvest festivals happen some time in the early autumn and celebrate the bringing in of the harvest. At St James's, Harvest Festival is generally celebrated on the first Sunday in October with an All Age Service at 11.00. St James's Players accompany the hymns and play other music during the service. The uniformed groups join the service and participate by carrying their flags in a colourful parade through the church. The service includes stories, songs, prayers and activities for the young and not so young. St James's Church is always beautifully decorated with flowers, sometimes fruit and vegetables and in the past a large loaf in the shape of a wheatsheaf. Harvest Festival reminds us of all the good things God gives us and so we give thanks by singing, praying and decorating our church. Usually people bring gifts of tinned and dried goods and also harvest produce. These are later given to people in need, either locally, or perhaps in other countries, but usually to the Upper Room. We say thank you to God for the harvest and share with others who are not so fortunate. 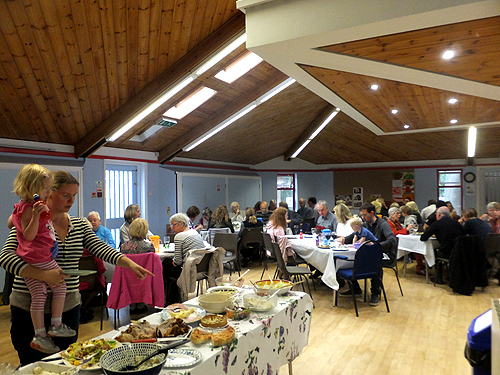 After the service everyone gathers in the church hall for a shared celebratory Harvest lunch. The Christian tradition of giving at harvest-time goes right back to Biblical times. The Jews gave a tenth of their harvest to God. This was known as a tythe or tithe. And in this country farmers had to give a tithe of everything that came from the ground. Tithes were payments in kind (crops, wool, milk etc.) which were an agreed proportion of the yearly profits of cultivation or farming. They were given by parishioners for the support of their parish church and its clergy. Grain was stored in huge tithe barns, some of which can still be seen today. This law was scrapped by the Tithe Act in 1936. However, many Christians still choose to give some of their income to the church throughout the year - for some, a tenth of the money they earn. At harvest-time, giving food reminds us that God has provided for our needs throughout another year.